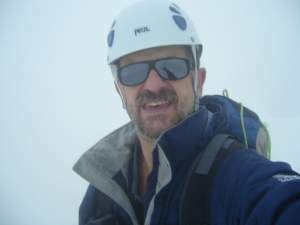 In this Mystery Ranch Stein 62 review you can read about a load hauling pack designed for loads of up to 75 lb (34 kg), with a unique detachable lead that doubles as a daypack, and built from a very durable fabric. Mystery Ranch Stein 62 Backpack. The top lid converts into a daypack. 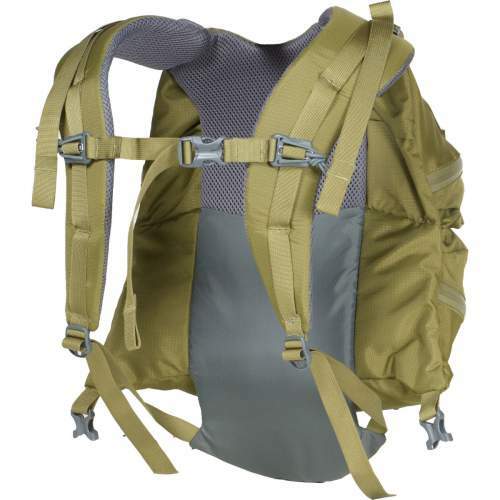 The Stein 62 is a top loading pack built in several sizes S, M, L, and XL. But you also have a side waterproof zipper to get to the main compartment, and in addition to this there is also a bottom compartment entrance. The main compartment is a simple area with a lined sleeve that makes the pack hydration compatible. There is a compression strap inside the collar so you can cinch the load before you close it. In most packs this strap goes over the collar so that you can put a piece of equipment under the lid and fix with the strap, so what they used here is not the best design, although the compression strap has its role. The nominal volume capacity is 62 liters (3783 in³) and they claim it is designed to carry up to 75 lb (34 kg). Note that the pack itself weighs 4.7 lb (2.13 kg) which is not so lightweight, but for such a carry capacity you would not expect anything lighter. So this is a pack for heavy loads and for long hiking and backpacking tours. The pack is for men, but they have also the version for women built in XS, S, and M sizes. The suspension system is based on a carbon fiber frame, so this is all you have here, no metal bars. The harness is adjustable and you have Velcro hook and loop design behind the harness. You can choose any length, this is not a system with some discrete positions for the harness, like a ladder type which you have in some packs; so I like it as it is. This allows for several users with different body size to use this pack. However, the back panel is completely flat, so do not expect any ventilation channels here or a suspended mesh. 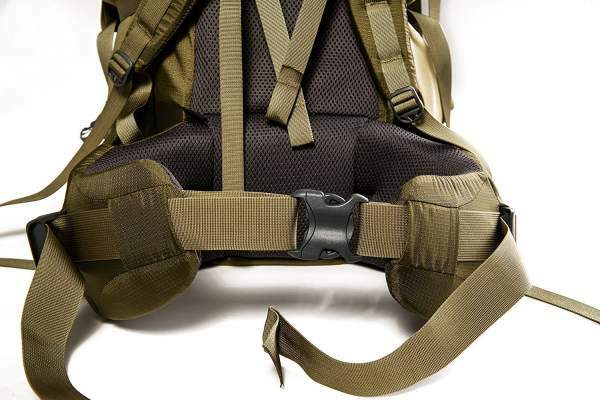 All is padded by a dense foam which you have on the back and on the harness, as well as on the hip belt, see the picture below. The hip belt with its massive padding, no pockets here. Here you have an unusual design with a very long horizontal and water-resistant zipper and you have two buckles on the sides, see the picture below. Such a long zipper is to have a larger entrance and to put a sleeping bag easily in, and the buckles system acts like a compression strap. But you also have an inner strap to compress the content separately and to reduce the stress on the zipper. So this is a good design; in most of the packs you have an inverted U-shaped zipper which is not always easy to deal with. The daypack – front view. Here you see the harness taken from the main pack. 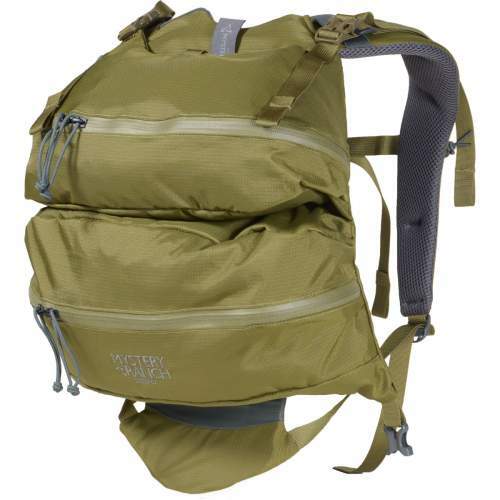 It reminds me a bit of some of those running packs like this Ultimate Direction Fastpack 15. The daypack looks good and comfortable but observe that there are no attachment elements for an ice axe or poles, and this is not so great if you are using as a summit pack. If you disregard this detail, it is very nicely designed and very functional but perhaps a bit too complicated to use. You have two pockets on the front with water-resistant vertical zippers that run parallel on the sides of the pack. The usual stretch mesh pockets are on the sides for water bottles or to store some longer objects. The lid is with two large pockets which you see in the pictures of the daypack. Note that there are no pockets on the hip belt, but the existing 6 pockets are useful. I already mentioned two compression straps in the bottom compartment and inside the collar. You also have dual side compression straps that run horizontally, so whatever you store in the side pockets, you can fix in place with them. The lover straps are with inside-out feature with respect to the side pockets so you can run them through the pockets or over them. Dual daisy chains are on the front, this is always useful to have. There are bungee cords in the same area and you use together with the dual loops on the bottom for ice axe or trekking poles attachment. The pack is without rain cover and the fabric is not particularly waterproof. But the fabric is indeed a very durable 400D nylon. As of the moment of writing this text, the Amazon price for this pack is $299, so it is quite expensive. You will see some other options in the comparison table below. Weight: 4.7 lb (2.13 kg). Volume: 3783 in³ (62 l). Load capacity: 75 lb (34 kg). Dimensions: 36.5 x 17 x 14 in (93 x 43 x 36 cm). – M & L: 18 – 21 in (46 – 53 cm). – XL: 21 – 24 in (53 – 61 cm). – S & M: 29 – 34 in (74 – 86 cm). – L & XL: 34 – 39 in (86 – 99 cm). You have seen the load capacity of this pack and its weight, so it is appropriate to compare it with some other load hauling tools. I show it side by side with the Mountainsmith Lariat 65 and the Osprey Aether AG 60 pack. 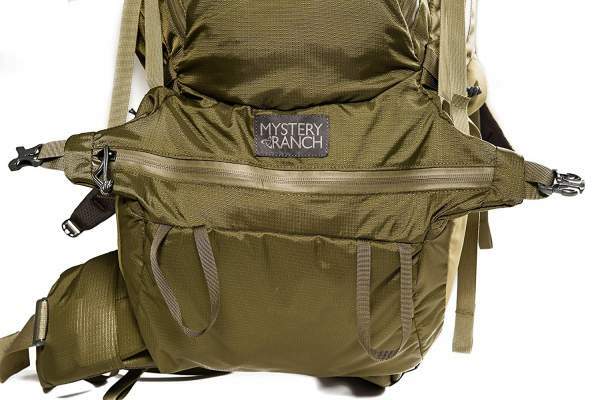 Observe that the Mountainsmith pack is half the price of the Mystery Ranch price and it is 610D Cordura fabric. In the summary of this Mystery Ranch Stein 62 review I would stress that there can be no question about the quality and the craftsmanship of this pack, this is a top-notch tool. Though it is expensive and it lacks some features which I love to have. But if you have no issues with this, and can afford it, do not think twice, this is a great pack. Its lid converts to a daypack and this is why I have included it in my list of backpacks with daypacks. If you still need something different, please visit my page with backpacks above 56 liters, you will find all top brands reviewed in detail. In the case of questions and comments, please use the comment box below. Have a nice day.